The application of razor-thin sheets of polyethylene film across farmland began in the 1950s when agronomists noticed that it could successfully moderate soil temperature, limit weed growth and prevent moisture loss. All essential factors in crop production, this method was found to increase cotton, maize and wheat yields by an average 30%. This was a significant achievement, especially in a world where rising populations rely on increased rates of food production to survive. The promise of increased yields at a relatively low cost formed a multi-billion dollar industry for agricultural plastics. 2,500 square miles of agricultural farmland utilized polyethylene covering for crop care in 2012, requiring 4.4 million tons of plastic. Plastic production for agricultural mulch is expected to see a 69% increase to 7.4 million tons by 2019. Firstly, dangerous toxins released from the polyethylene film can remain in the soil for centuries. Known as white pollution, polyethylene residue is becoming increasingly prevalent in treated soils at levels of up to 300 kilograms (661 pounds) per hectare. Over time, this decreases soil porosity and air circulation, alters microbial communities and compromises soil fertility. Polyethylene also releases carcinogenic phthalate acid esters into the soil, which together with other synthetic pesticides can be easily absorbed by the crops. This is a significant risk to human health. What’s more, the polyethylene films used in the coverings are low density by design, which makes the plastic extremely difficult to biodegrade. Any waste from this process is rarely accepted by recycling facilities and often ends up in landfills and oceans, wreaking havoc on ecosystems around the world. Plasticulture, i.e. application of plastics in agriculture cultivation, is fast becoming the most sought out technique to augment farm yields and consequent farm income. In India, it can come in handy to realise the overall aim to double farm income domestically by 2022. This is more significant particularly since agriculture contributes ~14% to the national economy (GDP) while more than 50% of the population is directly or indirectly dependent on it for livelihood. Moreover, the erratic nature of rainfall during the key monsoon season also exposes national income to risk. Hence, it requires mitigation measures. India supports ~18% of the global population with ~2.4% of land area and ~4% of water resources thereby making judicious usage of water even more paramount. The benefits of plasticulture include a decline in water wastage, prevention of contamination from external agents and prevention of soil erosion. Micro-irrigation: This includes the use of drip irrigation and sprinklers in farms. With proactive steps being taken by various state governments like making it mandatory for farmers cultivating sugarcane to switch to drip irrigation (Maharashtra) and further streamlining of subsidy disbursal mechanisms, the domestic micro-irrigation industry is on a firm footing with robust prospects. Pond liners: It is the creation of an artificial pond to conserve water during the monsoons. Domestically, Rajasthan and Maharashtra are at the forefront of promoting pond liners in a big way and are witnessing robust growth prospects. Greenhouses: It is a farming technique wherein the crop is grown in a controlled environment and is covered through firm nets or plastics through a frame. Plastic mulching: This is a farming technique in which crops are grown through holes in sheet, laid all over the ground. It prevents the contact of soil with atmosphere and, hence , helps prevent moisture loss. Speaking on the “Role of plasticulture” on the second day of the 3 day Global Rajasthan Agritech Meet 2016 (GRAM 2016) being held in Jaipur, Principal Secretary, Agriculture, Government of Rajasthan, Ms. Neelkamal Darbari stated that the Agriculture Sector has immense opportunities for ‘Plasticulture’ . She further said that in order to achieve the mission of doubling farmers’ income by 2022, it is imperative that low cost and high quality plastic should be made available to the farmers. Being a scarce and valuable resource, water should be used judiciously and plasticulture will go a long way in limiting its use. New technology and processes should also be made available to the farmers so that the productivity and product quality can be increased with limited usage of water, the Principal Secretary added. She concluded her special address with the slogan — “Per Drop More Crop”. Highlighting the role of the Irrigation Association of India, Director, Irrigation Association of India (IAI), Mr. Arijit Sengupta said that the association is working closely with Prime Minister Modi’s aim of providing ‘har khet ko paani’. He also said that the industry leaders, manufactures and government should work more closely to spread the awareness about plasticulture and make it easily available at a low cost to the farmers. To enable, the Indian Plastics industry to realize its potential, FICCI jointly with Dept. of Chemicals & Petrochemicals, Govt. of India & Department of Agriculture, Cooperation & Farmers Welfare, Ministry of Agriculture organized the 5th National Conference on “Potential of plasticulture in India” in May, 2016 at Federation House, New Delhi. At the event, a joint FICCI-TSMG (Tata Strategic Management Group) report titled Role of plasticulture in Next Generation Agriculture was released. The report claims that plasticulture can reduce the losses in harvesting, and increase the value of output by Rs 68,000 crore across the country. So what is the problem with plasticulture? As with the concerns with plastics in other sector, there are issues with their application in agriculture also. Over time, film residue can decrease soil porosity and air circulation, change microbial communities, and potentially lower farmland fertility, scientists have found. Fragments of plastic film have also been shown to release potentially carcinogenic phthalate acid esters into the soil, where they can be taken up in vegetables and pose a human health risk when the food is consumed. Film fragments left in fields can also accumulate pesticides and other toxins applied to crops. This is a special risk for sheep, goats and other livestock grazing on crop stalks because of their potential to ingest plastic material or the chemicals that leach from it. When cotton crops are grown in plastic-contaminated soil, the lint risk being contaminated. If that were to happen, the quality of the output is downgraded because traces of plastic can interfere with the coloring process. And then there’s the plastic pollution that makes its way into rivers and oceans, which can be toxic for aquatic life. Another issue with regard to the plastic mulch (films) is that it is not easy to recover and reuse them. Although films in US, Europe and even India are thicker than 15-20 microns, Chinese films are less than half the thickness of those films and go down to about 8 microns. That thinness makes the material less robust and more difficult to recover after use. China is predicted to increase its use of plastic mulch by 38 percent to more than 2 million metric tons a year by 2024. According to a study from a report released data from the University of California and Santa Barbara, as of 2015, approximately 6300 Mt of plastic waste had been generated in the world, around 9% of which had been recycled, 12% was incinerated, and 79% was accumulated in landfills or the natural environment. If current production and waste management trends continue, roughly 12,000 Mt of plastic waste will be in landfills or in the natural environment by 2050. Why do we still continue with plasticulture? 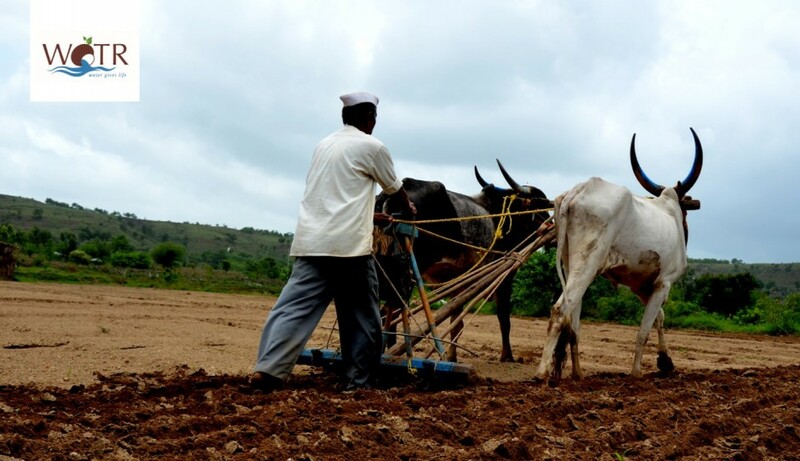 With increasing population and limitation over increase in acreages, augmenting farm yield is the only viable option for increasing agriculture production. Plasticulture, which is indeed a scientifically proven methodology, helps in this pursuit. The Ministry of Agriculture, Government of India believes that its optimal application is a step in the right director to achieve the overall vision to double farm income by 2022.
saving in other agri inputs viz. agro chemicals & fertilisers. Plasticulture can well be imbibed as the mainframe system within the ambit of sustainable agriculture practices domestically. Its effective implementation is likely to result in robust food grain production and consequent rise in agriculture GDP in excess of 4%. Plastics are no doubt a ubiquitous and a ‘necessary’ material for humankind. But on the occasion of World Environment Day, as we look back at the impact and use of plastics in nearly every sectors, concerns are rising about what happens to these after use. India hosts the World Environment Day for 2018 and has taken a slew of steps in recent months to ban use of single use plastics, mainly in the form of polythene bags and bottles. The use of plastics in agriculture could be the next big segment for plastic manufacturers to target, and that is going to be disastrous considering the effects on soil health, microbial communities, potential release of carcinogenic compounds into the food chain and also loss of commercial value to crops such as cotton. There are alternatives. A recent UN Environment report discusses the use of: 1) alternative natural materials obtained from plants and animals, and 2) newer generation bio-polymers which are plastics made from biomass sources. The report highlights some relatively conventional alternatives to plastics – such as paper, cotton, and wood – as well as less obvious solutions including algae, fungi, and pineapple leaves – among others. With regard to agriculture in particular, some of the solutions might come with a little more physical effort (using organic mulch) or others that come at slightly higher cost (biodegradable materials). Therefore, state and national policies have to come to the rescue to incentivize good and responsible behavior. Steps such as those taken by smart cities like Muzzaffapur and progressive states like Maharashtra in banning single use plastics and enforcing penalties for non-compliance will certainly help. But we need to go beyond just ban of plastic bags and address its use across all sectors if we are to make a difference to contamination of our soil, water, food and air. And while research and development helps develop more alternatives as commercial options, the traditional resource management principles of reuse, reduce, recycle will continue to hold true. Want to mobilize people for water management? Let the “Unspoken of” surface! Do changes in land use patterns affect gender roles and relations?